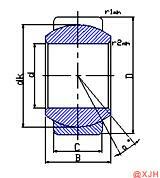 The structure of the Spb GE.E Series is simpler than a rolling bearing. It consists mainly of an inner ring with an outer spherical surface and an outer ring with an inner spherical surface. Joint bearings are generally used for low-speed oscillating motion (ie angular motion). The structure of the Spb GE.E Series is simpler than a rolling bearing. It consists mainly of an inner ring with an outer spherical surface and an outer ring with an inner spherical surface. Joint bearings are generally used for low-speed oscillating motion (ie angular motion). Since the sliding surface is spherical, it can also be tilted in a certain range of angles (ie, aligning motion), and the support shaft is not concentric with the shaft hole. When the degree is large, it still works normally. Outer ring of carbon chromium steel,fractured,hardened and phosphated,sliding surface treated with MoS2.lnner ring of carbon chromium steel,hardened and phosphated,sliding surface freated with MoS2,if has characteristcs of wear-resistance,anti-corrosion and self-aligning,suitable for heavy radial loads and any direction lower axial loads mechanism. Spb GE.E Series is widely used in engineering hydraulic cylinders, forging machines, engineering machinery, automation equipment, automotive shock absorbers, hydraulic machinery and other industries. The joint bearing is a spherical plain bearing, and the basic type is composed of inner and outer rings having a spherical sliding spherical contact surface. Depending on its structure and type, it can withstand radial loads, axial loads, or combined loads acting in both radial and axial directions.